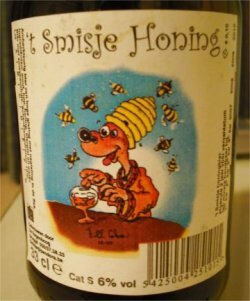 I believe this was the first Smisje, a honey beer since 1996. Malty and yeasty, with a rather subtle presence of honey in the nose but more so in the mouth, thus becoming sweet (after a rather neutral onset), with a yeasty, fruity finish with low bitterness. Typical Belgian honey beer, not all bad but I had better examples of the style. Honey beers are usually too sweet and unfortunately, this one is no exception. It still has the Smisje touch, but the sweet honey is too dominant. 7th May 2008. Nominally a honey beer but tastes overwhelmingly of chemicals and soap. Infected? Undrinkable! Bottel. Aroma is a little sour. Pours clear, slightly amber colour with medium white head, that lasts for some minutes. Taste is mosty sour with a hint of honey in the finish. Perhaps this is infected? Amber coloured beer with a small white head and some average carbonation. Special herby aroma with a light sweet honey touch. Full palate. Finish is again rather herby, light honey sweeter hints comming with it. Had better honey beers, but not to bad. Clear amber coloured beer with small white head and no carbonation visible. Full palate slightly sparkling. Honey sweet aroma with bits of herb. Finish is herby at first turning into more sweet at the end. Bottled at home. Orange coloured, dying head. Spicy nose, honey. Not as overly sweet as a had expected, pretty dry. Thin mouthfeel. Definitely not all brews from this brewery are good.